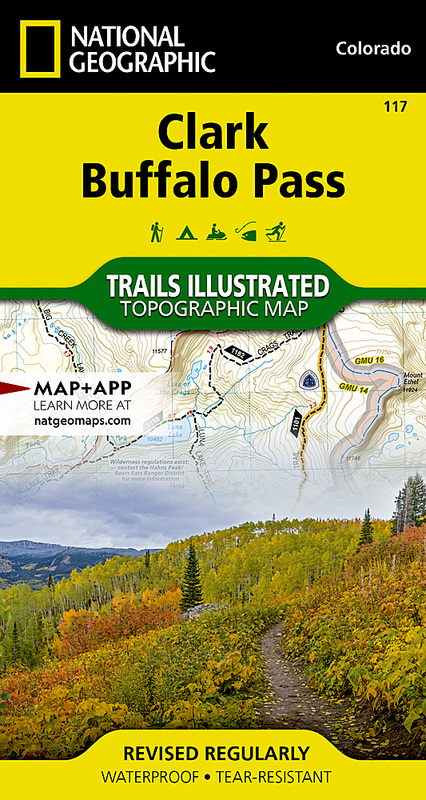 Created in cooperation with the U.S. Forest Service, Bureau of Land Management and others, National Geographic's Trails Illustrated map of Clark and Buffalo Pass delivers unparalleled detail for outdoor enthusiasts exploring this region of northern Colorado. This expertly researched map will lead explorers through Routt National Forest, along the Continental Divide as well as the surrounding areas. Coverage includes Mount Zirkel Wilderness Area, Christina, Odd Fellows and Irvine State Wildlife Areas, Spring Creek Mountain Park and Summit Lake. Get off the beaten path and back on again by following the map to trailheads and then along mapped trails. Trail are all marked for hiking, hard surface bike, mountain bike, snowmobile, motorcycle, ATV or cross-country ski usage. The area's road network is mapped as well, including numbered Forest Service roads. To aid in your navigation, the map shows contour lines with elevations; labeled peaks, summits and passes; water features; areas of wooded cover; selected waypoints; and clear color-coded boundaries between National Forest, Wilderness and State Park land. Among the pinpointed recreation features are campgrounds, picnic areas and fishing holes. Also listed are the Leave No Trace guidelines, wilderness rules and regulations, survival tips and essential contact information. Other features found on this map include: Mount Zirkel Wilderness, Park Range, Routt National Forest.